You’ve decided to synchronize supply and demand and now you need a roadmap to SI&OP success, which was defined in our last blog as we discussed creating the proper alignment and balance between demand and supply. It’s a journey to enabling Clean Orders, which requires a pilot for steering, a pilot area and a series of preparation steps. Implementing or e-implementing a World Class SI&OP process starts by following a proven roadmap using a “Phased Approach” to achieve major mile markers. Don’t expect too much, too fast — start with a pilot area and build from there. Identify the key wants/needs of your major players (Finance, Sales, Operations) and begin modeling a straw man process. You may need to “dial it in” to continually improve the process. 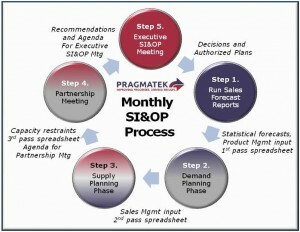 We recommend using a high-level SI&OP process that operates on a repetitive monthly cycle. The process requires outlining data collection processes, timing and responsibilities of the participants. 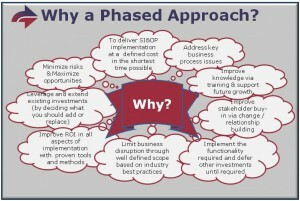 Start by prototyping the key concepts and establishing detailed processes for demand, supply and consensus building. Define the data requirements (population) and develop the SI&OP tools, report formats, key measures and meeting packages. At the same time, identify the key meeting participants and communicate the level of commitment / participation needed for each process so everyone understands what’s required. Establish and publish notes from all meetings (Demand, Supply Consensus, Executive Review) to keep everyone in the loop. Having the right level of project management is a crucial pilot to steer your journey. Choose someone that has a proven track record of implementing SI&OP successfully and navigating across key areas of your organization. Now you’re ready to get started. In our next article, we will describe Execution and Key Deliverables for the SI&OP Process. Let us know if you have questions along the way.